Mountain View California --- Skycorp Incorporated and Ettus Research, a subsidiary of National Instruments, have joined forces for the development of a crucial piece of hardware needed to contact the ISEE-3 spacecraft. Contacting ISEE-3, launched by NASA in 1978, is the focus of the ISEE-3 Reboot Project. ISEE-3 will be returning to Earth orbit in August of this year after having circled the sun for nearly four decades. SpaceRef Interactive, Skycorp, and Space College have joined forces to rescue the spacecraft, put it back into orbit near Earth, and use it for scientific research and STEM education. NASA has formally stated that it does not have the funding to rescue the spacecraft. To complicate matters, the equipment needed to speak the language used by this antique spacecraft, a spacecraft that has no computer onboard, no longer exists. Thus, a high risk, extremely short schedule project was begun to attempt to save the spacecraft and put it back into Earth orbit in August 2014. USRP N210 units delivered to ISEE-3 Mission Control today. 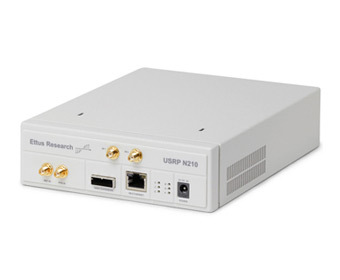 "The USRP N210 provides high-bandwidth, high-dynamic range processing capability. The USRP N210 is intended for demanding communications applications requiring this type of rapid development"
Skycorp's CEO Dennis Wingo said "NASA does not have the old hardware to talk to the spacecraft anymore. A device akin to an old dialup modem is needed. Since the schedule to do this is so short, using a traditional development approach is impossible. With the continuing advances in technology for software-defined radios what was once impossible is now merely difficult. Shortly after meeting the Ettus Research team they managed to put something together in days that would have taken months to do just a few years ago. This led us to chose Ettus Research to lead the development of the software radio we needed. Without the expertise, cooperative spirit, and a can-do attitude of the Ettus team this task would have been far more difficult - if not impossible." Ettus Research has already shipped hardware for the effort from their off-the-shelf selections. The ISEE-3 Reboot team will soon be headed to the Arecibo Observatory in Puerto Rico to attempt the first contact of an interplanetary spacecraft by a non-government entity. In an era of constrained financial resources we are please that NASA is allowing this type of activity to occur for the purpose of extending scientific research and supporting education. SpaceRef, Skycorp, and Space College are financing this adventure through the contributions of enthusiasts around the world through a crowd funding effort on Rockethub (http://rkthb.co/42228).